Since 2005, Bella Faux Finishes’ painters and artisans have been honored to apply the final layer of effect to a variety of interior design, homebuilding and remodeling projects in Sioux Falls, South Dakota, Sioux City, Iowa, Dakota Dunes, South Dakota and beyond. 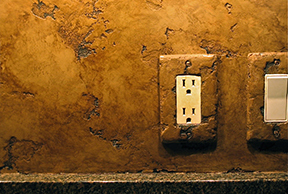 With several years experience in the application of new Faux Finishes, Italian finishes and Venetian Plaster, David and Mark Nordgren offer their unique artistic services to customers across the greater Midwest, including Sioux City, Iowa, Dakota Dunes, Omaha, Nebraska and Minneapolis, Minnesota. Each project we participate in has its own unique design goals. The fun begins with our initial brainstorming session, where we discuss the interior design process. We then proceed to help you select the style, color and texture of the decorative finish, interior paint or wallpaper. Mark and David performed absolute magic on my home when they worked on a dome in my master bath and literally transformed it with the marbleized Venetian Plaster. Nothing else gathers as much attention as this amazing feature! "Stunning work, incredible work ethic! Thank you so much! "Thanks Mark!! I think of you and David every time I look at my beautiful walls. So glad I met you… and Thank You for lending your Artistry to my home." I want to thank you guys again for switching things around so you were able to come to Aberdeen, South Dakota. We love the Ceilings - Amazing Work and even better Customer Service. Thank you Mark, David and Michael for everything. Your work in the house is Spectacular! David, Thank You so much. The Walls are Beautiful and we appreciate your hard work!!!! Its absolutely beautiful! You do amazing work and I am TOTALLY glad that I chose the Bella Faux WOW Finishes over pseudo-paint options. KUDOS to you Mark! Anyone needing a testimonial on Bella Faux Finishes, I would be happy to visit with you. I love my bathroom and recommend this amazing team to do your project! They not only do beautiful breathtaking work, they get their project done on time, they are neat and tidy with the project, they have lots of great ideas and make good suggestions, they are true to the price quoted, they are very talented and care about their artistry and really sincerely care that the customer is happy. I would recommend Bella Faux to anyone who wants to beautify their home and wants to make their home unique!!! I would recommend Bella Faux Finishes to anyone! From the first day I met you, it was truly my pleasure. You are a great team. I enjoyed your presence while you were here working. I think it added something to the atmosphere! Please feel free to use myself or my home as a reference anytime. Finally got out to the house today to see your finished work of art and it’s amazing! The bedroom ceiling is gorgeous! Jeff’s mom drove down to see the walls and was incredibly impressed. She believes your painting adds so much value to the house, and she’s been a Realtor for 60 years, so she knows what she’s talking about! I’m sure you hear this with all your projects, but the work you’ve done for us is absolutely perfect and puts the house over the top for us. Watching the sunlight play across the living room walls is so neat! Have David bring some business cards by to share with family and friends who see our home. We will be more than happy to give them your contact information and website. We are just thrilled! Thank you so very much!!! We are very excited to have you do the ceilings in the house. We will definitely do the master bedroom and bath and foyer. Thank you for the beautiful job! We are so pleased! You definitely achieved the “Wow Factor”! You were fun to work with. The Wall has turned out just lovely. The drapes go up tomorrow and I’m so excited to see it all come together. Thank you so very much and it was a pleasure to work with you and David. Thanks so much! We LOVE the effect and will no doubt love it even more when the entire room is put together. Not only is David a fabulous Artisan, but a very personable and nice young man... We were very impressed! “Really truly, we so appreciate the fine work you did for us - it looks so wonderful. Thanks for all your hard work!